Welcome to Music Friday when we bring you fabulous songs with jewelry, gemstones or precious metals in the title or lyrics. 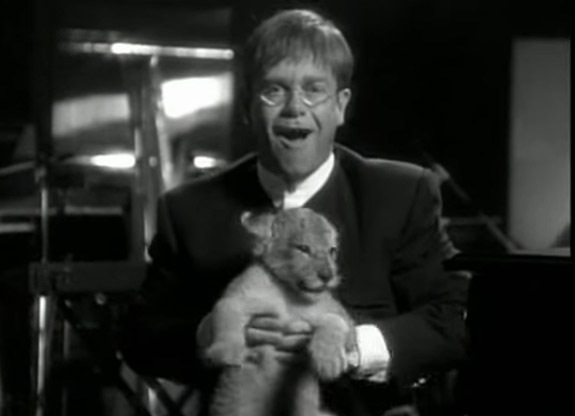 Today, we feature the Oscar-nominated "Circle of Life," the 1994 Disney collaboration between two musical powerhouses — lyricist Tim Rice and composer Elton John. Written for the blockbuster animated film The Lion King, "Circle of Life" is about nature's way of taking from — and giving back — to the earth. Rice, a brilliant wordsmith, uses a precious gemstone to paint a vivid picture of a planet in harmony. 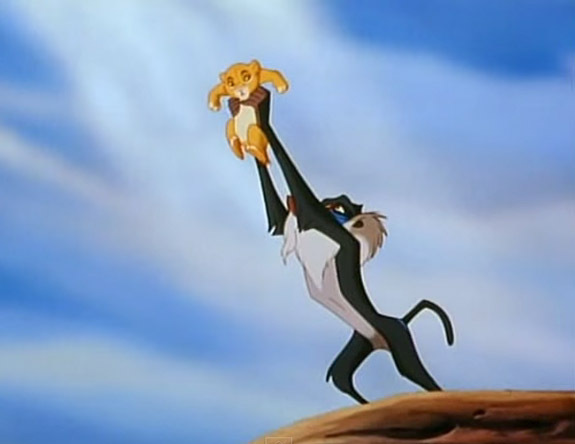 In the memorable opening scene, a newborn lion cub, Simba, is held aloft by the monkey Rafiki, atop Pride Rock — against a sapphire blue sky. John sings, "There's far too much to take in here / More to find than can ever be found / But the sun rolling high through the sapphire sky / Keeps great and small on the endless round." "Circle of Life" was one of three Lion King titles to be nominated for the 1994 Academy Award for Best Song. The Oscar ended up going to "Can You Feel the Love Tonight," another Rice/John tour de force. Even though "Can You Feel the Love Tonight" took the award, John has said that he preferred "Circle of Life." He characterized Rice's lyrics as "brilliant" and he often performs the song in concert. "Circle of Life" has two versions, one sung by Carmen Twillie in the film's opening scene, and the pop version performed by John with the support of the London Community Gospel Choir. John's version became a Top 20 hit in both the U.S. and the UK. Interestingly, both Rice and John were knighted by Queen Elizabeth II, Rice in 1994 and John in 1998. Rice is best known for writing Joseph and the Amazing Technicolor Dreamcoat, Jesus Christ Superstar and Evita. John has had 58 Billboard Top 40 singles and has sold more than 300 million records worldwide. Lyrics by Tim Rice. Music by Elton John. Performed by Elton John. A beauty salon in Southern California is offering a $25,000 manicure package that includes premium champagne, French-imported pastries, spa treatments, 20 GIA-graded diamonds and the expert assistance of a personal jeweler. 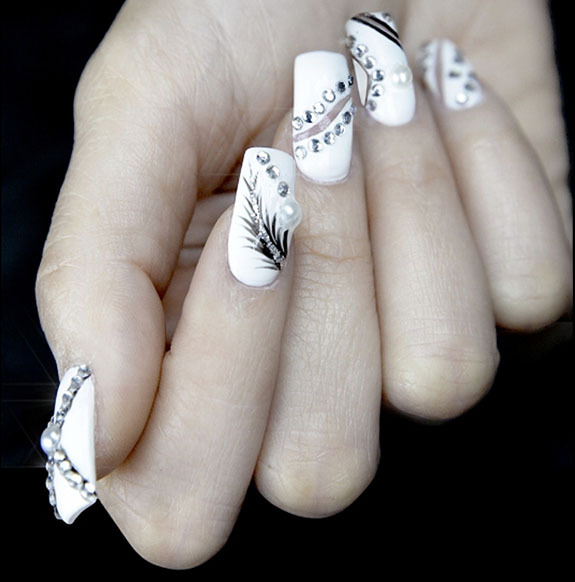 Catering to the ritzy clientele of Irvine and Newport Beach, Calif., Images Luxury Nail Lounge recently introduced three bling-tastic offerings ranging in price from $500 to $25,000. The most luxurious of the packages is called “Glitz & Glamicure.” For a service fee of $10,000 to $25,000, the salon will close its doors to the pubic and lavish the customer with a long list of elite services. Each client will sip premium champagne and eat French-imported pastries while consulting with a personal jeweler in the selection of 20 GIA-graded diamonds that will be used in the manicure design. In additional to the diamond-adorned manicure, the “Glitz & Glamicure” package comes with an hour-long message, rejuvenating luxury facial and the Images Celebrity Makeover, which includes eyelash extensions and a waxing/threading service. General manager Tony Nguyen told the Orange County Register that six clients have already earned “bragging rights” for being the first to indulge in the “Glitz & Glamicure” package. "We have clients that request services like this, so when we decided to do a luxurious menu, we talked with them about all the things they would want together," Nguyen told refinery29.com. "I can't tell you their names, but there are women in Newport and Irvine that want to really splurge once in a while." The spa’s second-tier package, the Gold Rush Manicure by Models Own, carries a price tag ranging from $2,500 to $10,000 and takes place in a private suite. A-listers will bask in gilded luxury as their nails are applied with Models Own Gold Rush lacquer, said to be the second-most-expensive nail polish in the world at $130,000 per bottle. 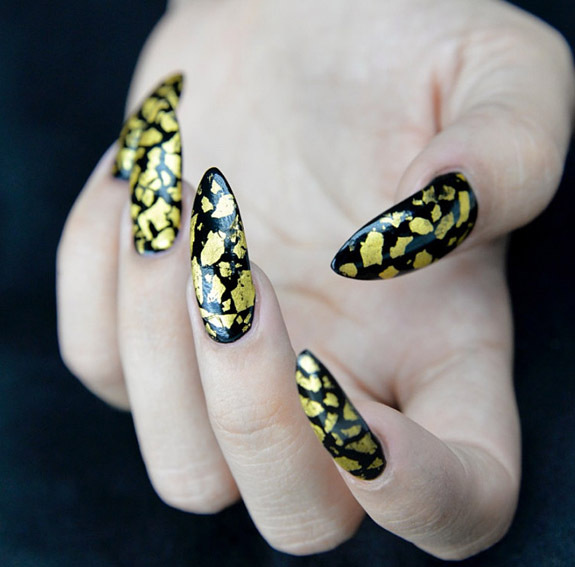 The effect, according to Bornrich.com, are nails that “shine like diamonds on a platter of gold.” The application of 24-karat gold flakes takes this manicure to the next level. The Gold Rush Manicure includes champagne, facial, lash extensions and threading. 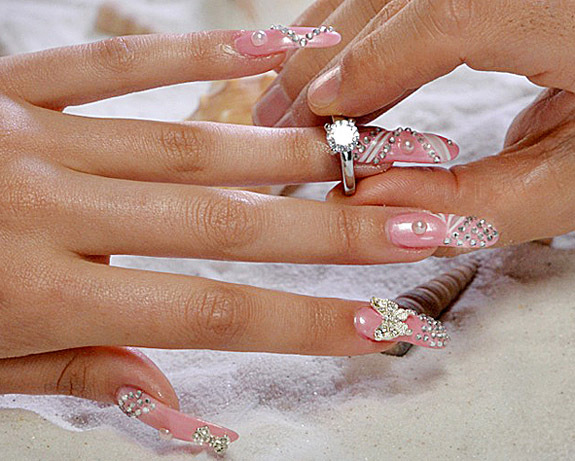 The third-tier package, ranging from $500 and $2,500, is the Haute Couture Manicure, which includes diamond nail art (up to 20 diamonds), mineral bath, facial, massage and polish. 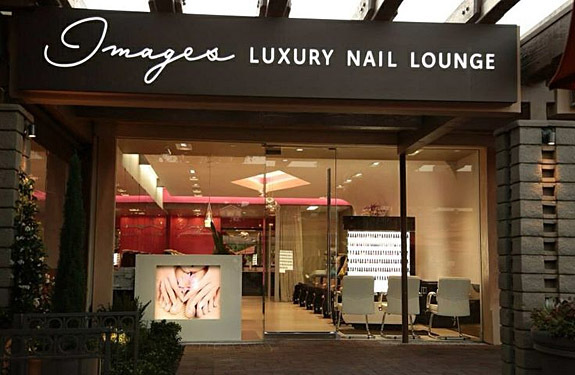 Images Luxury Nail Lounge operates salons in Newport Beach and Irvine. A third location, also in Irvine, opened last week. Photos courtesy of Images Luxury Nail Lounge. 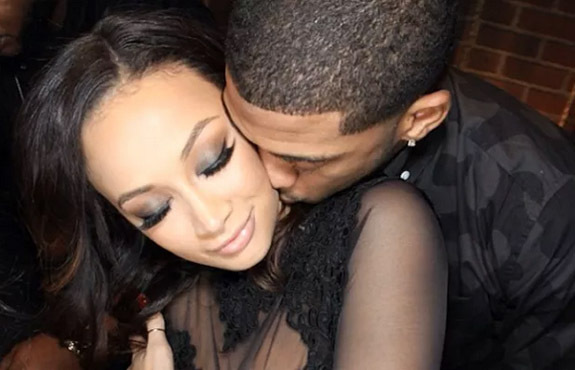 Dallas Cowboys cornerback Orlando Scandrick is used to the intense pressure of matching up against the best receivers in the NFL, but the prospect of popping the question to Basketball Wives LA star Draya Michele was a bit too much for the 28-year-old to handle. The proposal was set to take place during a special night out at Arclight Cinemas in Sherman Oaks, Calif. — the same place where they had their first date. But as the evening wore on Michele could sense that Scandrick was off his game. 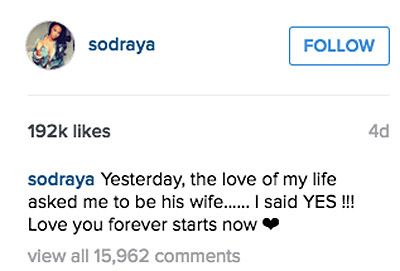 Scandrick brushed himself off and attempted to go forward with the marriage proposal. That’s when the silly moment grew even more awkward. "He got down on one knee and as soon as he started to talk I got nervous and couldn't help but to laugh hysterically. I was laughing and crying at the same time," Michele reported. Even though Scandrick muffed the proposal, he scored big with his selection of a beautiful 7-carat cushion-cut diamond ring, reportedly worth $400,000. The cornerback is credited with designing the ring with the assistance of Beverly Hills jeweler Jason Arasheben. “He was one of the most detailed-oriented clients," Arasheben said in a statement. "He wanted to make sure the ring was perfect, and she couldn't be happier." 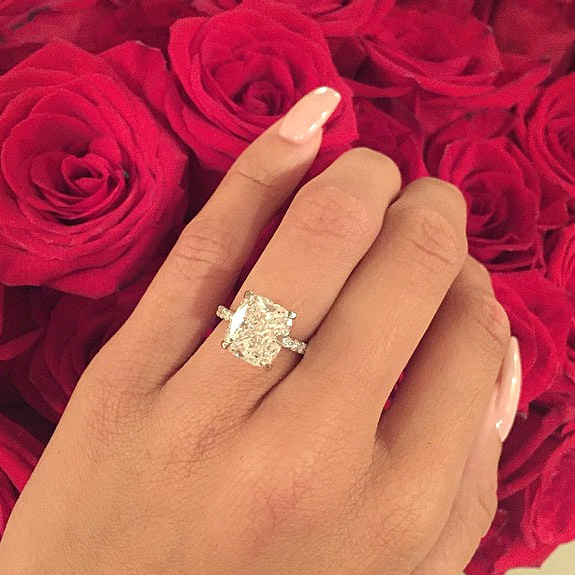 Last Friday, Michele took to Instagram to show off the dazzling ring. She modeled the ring against a background of red roses. Here’s how she captioned the shot: "Yesterday, the love of my life asked me to be his wife...I said YES!!! Love you @oscandrick32 forever starts now." The engagement news caught some fans by surprise because the couple had announced a split only a few months ago. Celebrity watchers reported that their busy lives had taken a toll on their relationship. Clearly, all is well now. Michele, a model and actress, has starred on VH1's reality show Basketball Wives LA since the show’s debut in 2011. 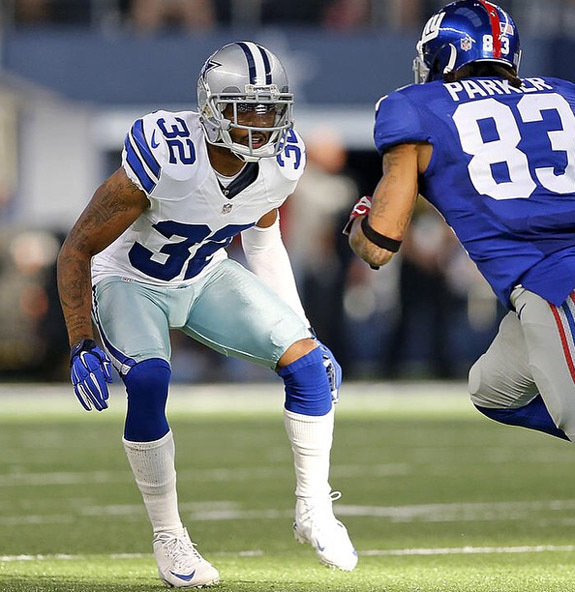 Scandrick, who was drafted by the Cowboys in 2008, has emerged as one of the best cornerbacks in the NFL, often handling the assignment of locking down the oppositions’ best receivers. 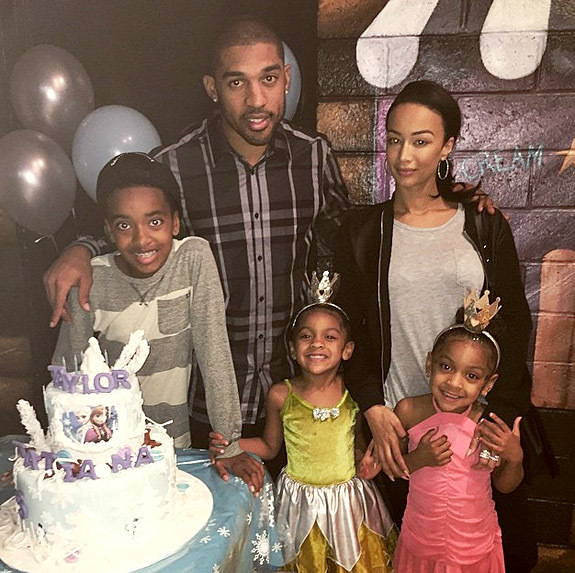 The couple is ready to blend a family that includes Michele's 12-year-old son, Kniko Arenas, and Scandrick's twin girls, five-year-old Tatyana Scandrick and Taylor Scandrick. 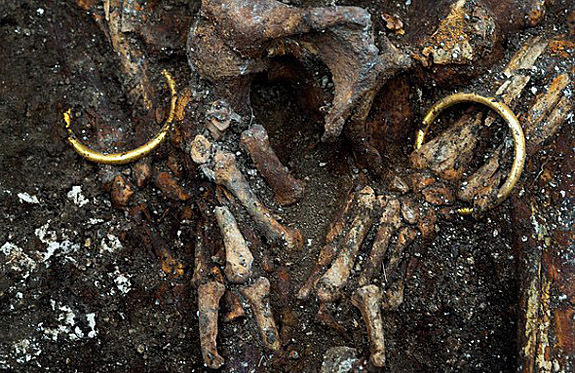 Archaeologists Discover 2,500-Year-Old Jewelry-Adorned Skeleton, But Was the Celtic Warrior a Prince or Princess? 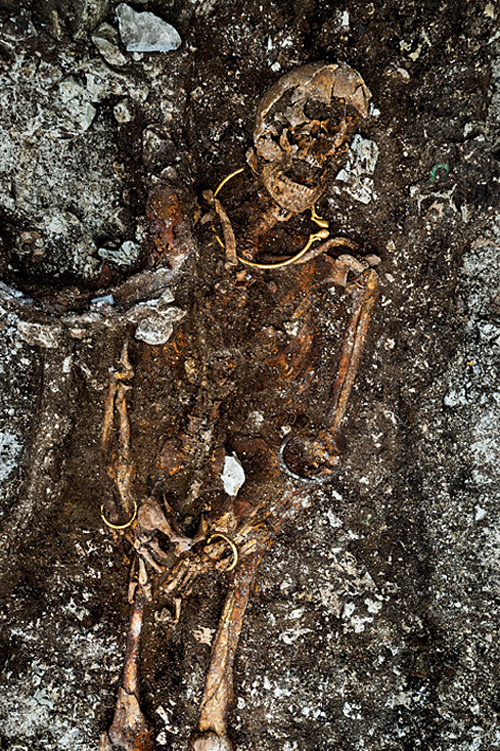 Buried in an ornate two-wheeled chariot and richly adorned with jewelry, a 2,500-year-old skeleton was discovered by archaeologists near Lavau, France, about 90 miles southeast of Paris. Finely worked amber beads, a jet armband, two gold bracelets and an elaborate solid gold torque necklace, weighing 1.2 pounds and decorated with winged monsters, were still on the skeleton. 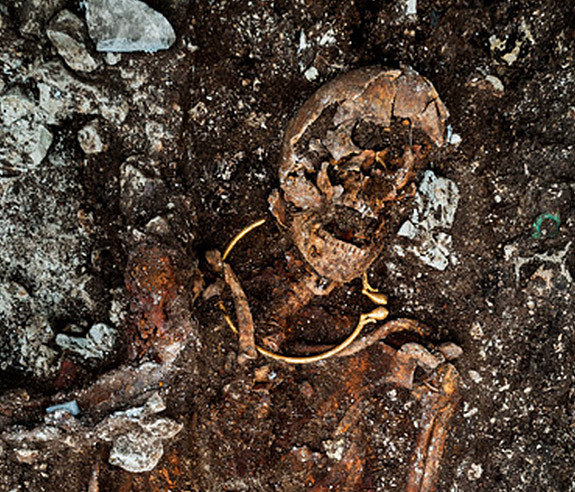 The tomb was filled with bronze, silver and gold artifacts, leading the researchers with France's National Archaeological Research Institute (INRAP) to speculate that the skeleton was a person of royalty. A debate continues, however, as to whether their subject is a prince or a princess. Due to the age of the skeleton and the poor preservation of the bones, scientists were not able to determine its gender. A sword found in the grave suggested that the individual may have been warrior. Still, that fact doesn't solve the riddle, because Celtic warriors of the fifth century BC were both male and female. 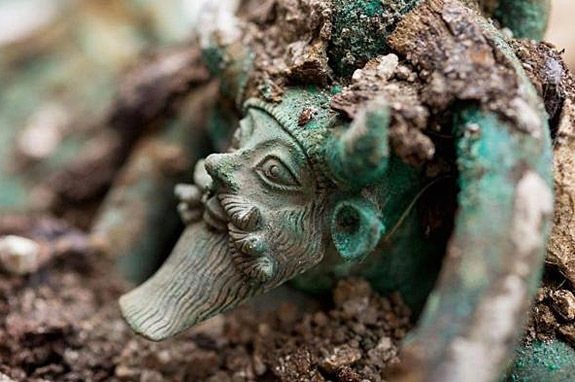 Also found at the site was a large bronze cauldron featuring four handles decorated with the likeness of Achelous, a horned river god of the ancient Greeks. International Business Times reported that the skeleton was found in a huge burial mound, called a tumulus, that was excavated earlier this year. It covered 7,655 square yards and was surrounded by a ditch and a palisade. 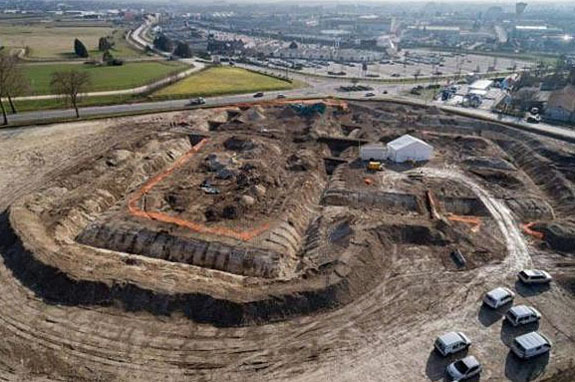 The archaeological site is adjacent to a new commercial center that was in the early stages of development when the ancient tumulus was discovered. INRAP explained in a statement that the period between the late sixth century BC and the beginning of the fifth century BC was characterized by the economic development of Greek and Etruscan city-states in Western Europe. Mediterranean traders came into contact with the continental Celtic communities as they searched for slaves, metals and precious gems, including amber. 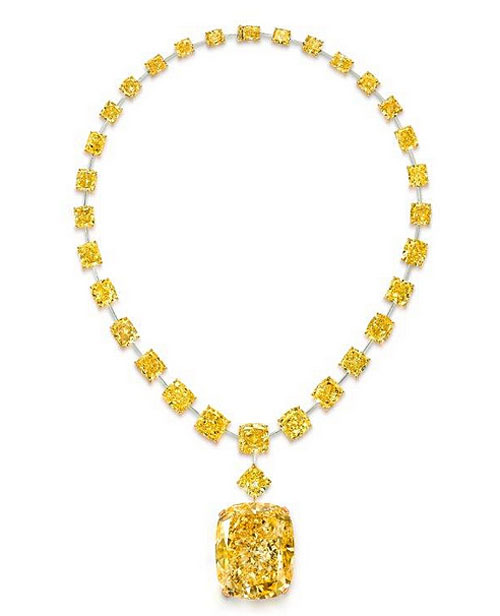 Described by Graff as having an inextricably feminine and intensely warm molten-like glow that radiates from its core, the fancy intense yellow diamond takes its seat in the pantheon of the world’s most noble and historic gemstones. The Golden Empress was born from a 299-carat rough diamond sourced from the famous Letšeng mine in Lesotho, a diminutive Kingdom in South Africa that is a powerhouse when it comes to producing large, top-quality diamonds. The 299-carat rough diamond also yielded eight satellite stones — six pear-shaped fancy yellows (the largest weighing 21.34 carats) and two round brilliants. The Golden Empress is currently set as a pendant dangling from a necklace adorned with 31 graduated fancy yellow diamonds. 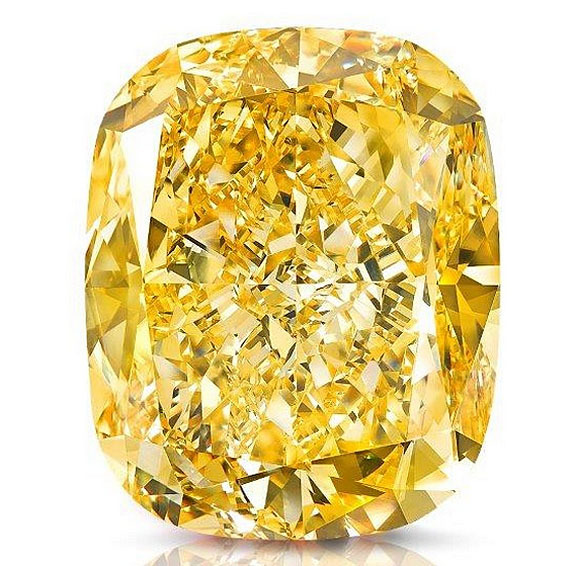 Graff made headlines in May 2014 when the 100.09-carat Graff Vivid Yellow achieved a world record price of $16.34 million at Sotheby’s Geneva. 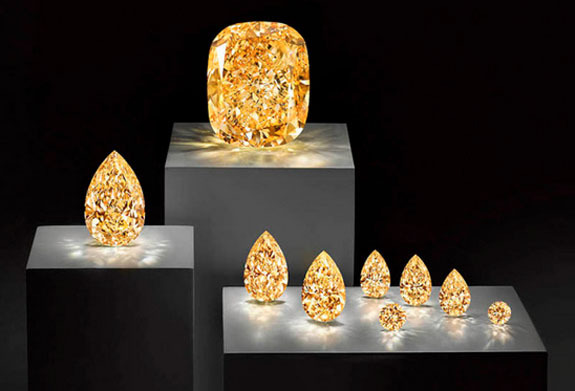 Other notable diamonds owned by Graff include The Delaire Sunrise, a 118.08-carat square emerald-cut fancy vivid yellow, and The Gemini Yellows at 51.29 carats and 55.74 carats, respectively. Maximizing the clarity and color of a 299-carat rough diamond is no easy task. ProfessionalJeweler.com reported that the first stage of the process required the meticulous study of the individual nuances of the stone, and the risks involved. “Colored diamonds refract and reflect light differently to white diamonds and are cut accordingly, ensuring the jewel’s individual saturation, tone and hue are optimized,” Graff said. Accordingly, Graff’s artisan cutters and polishers needed to strike a perfect balance between articulating the facets to allow the light to enter the stone, igniting the fire within, while not losing any of its color. Pure yellow diamonds owe their color to the faint presence of nitrogen atoms in the diamond’s crystal structure.